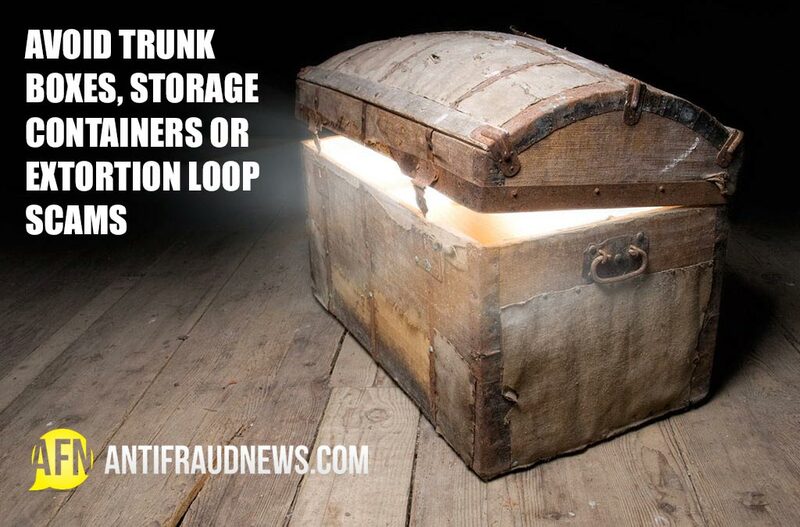 Trunk Boxes, Storage Containers or Extortion Loop Scams? The first thought that comes to mind when you hear “trunk box” is probably a storage container. So, what are trunk box scams you might ask? Trunk boxes are a type of advance-fee or 419 scam – they work by promising an individual/target the prospect of attaining a large sum of money for little to no effort. There are two versions of trunk boxes. The first scenario is where a trusted individual in a position of authority at an airport or shipping yard (such as a Head of Inspections officer) contacts you via email. This individual then proceeds to explain that they are in possession of a trunk box, or two, filled with an undisclosed amount of money. They then proceed to mention specific details about the trunk box in an attempt to legitimize their claims and can sometimes attach photos of trunk boxes. Thereafter, they will explain why the package was confiscated, which would usually be due to improper declaration. The package was confiscated due to the individual who initially shipped not being able to pay the fees or secure the proper inspection documentation to retrieve their package. However, the reason you are the one being contacted is that the official documentation of the package lists your personal details such as, your full name, full address and contact information. The person emailing you then states he is willing to give you this package provided you confirm who you are and provide him with a cut of the profits. The second scenario is where a person claiming to be enlisted in the military abroad has found a large sum of illegal money hidden away in trunk boxes. They then state that the trunk boxes were deposited outside of their current country, usually to Africa. This individual then promises you a certain percentage of the money in the trunk box, which can vary anywhere from 1 million dollars upwards, provided you assist them in recovering the trunk box. To legitimize their claims and gain your trust they will generally send through photos, including their passport, pictures of them in the military as well as the deposit certificate. Should you agree to help this person to retrieve the money, they will make you a beneficiary on the deposit certificate. The act of sending photos is all to build up a trust relationship, when in reality the pictures are probably stolen from the internet. Once the scammer gains your trust they will introduce you to a diplomat or government official which will assist you in the process of recovering the money from the trunk boxes. Then as time progresses the person assisting you with recovering the money will request money from you by saying that the trunk boxes are being held at customs and require a clearance fee. Scammers are very adept at what they do and attempt to gain trust by building a relationship with the target. One needs to realize that the scam part of the trunk box is that the only money that ever changes hands is from the target to the scammer. In order to protect yourself from this type of scam, you need to be able to identify it. Firstly, should the narrative of an email you receive follow the above-mentioned descriptions then this is most certainly a red flag. Secondly, should the email arrive from a private email account such as @gmail.com or @yahoo.com, this should raise concern since military officials or transportation officers will have company-related emails. Finally, and probably most importantly, any email which involves receiving a large sum money from someone you have never met should also be a warning sign. Should you find yourself victim to a trunk box scam be sure to report it to the Federal Trade Commission, and make others aware of the scam by sharing it on any and all social media platforms, thus exposing the scam to others who might fall victim to it.